Working with a team from The Ohio State University, Louisiana State University, and the French Institute for Research in Computer Science and Automation (INRIA), Sriram Krishnamoorthy, a research scientist and System Software and Applications Team Leader in the Advanced Computing, Mathematics, and Data Division’s High Performance Computing group, will join a select group of scientists whose work will be featured as part of the 37th Annual Association for Computing Machinery Special Interest Group on Programming Languages (ACM SIGPLAN) Conference on Programming Language Design and Implementation, known as PLDI. This year, only 49 of 304 total submitted papers—roughly 16 percent—were accepted for the PLDI 2016 conference that focuses programming language research, including design, implementation, theory, and optimizing languages. 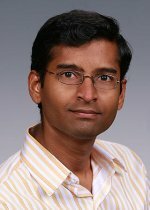 For Krishnamoorthy, it is the fourth time in a row his work, this time focused on avoiding cache conflict misses that lower computing system performance, will be featured in this leading programming language research forum. A synopsis of the paper, “Effective Padding of Multidimensional Arrays to Avoid Cache Conflict Misses,” which describes the first algorithms for optimal padding of arrays and the first solution to padding for nested tiles and multilevel caches, is now available online. The PLDI proceedings will be published as part of the ACM Digital Library. PLDI 2016 will take place June 15-17, 2016 in Santa Barbara, California. Hong C, W Bao, A Cohen, S Krishnamoorthy, L Pouchet, J Ramanujam, F Rastello, and P Sadayappan. 2016. “Effective Padding of Multidimensional Arrays to Avoid Cache Conflict Misses.” To be presented at the 37th ACM SIGPLAN Conference on Programming Language Design and Implementation (PLDI 2016), June 15-17, 2016, Santa Barbara, California.